Update 4/20/2006: I`m such a lucky girl (yes, my pet humans finally figured that out! ), I`m in a new family, with a huge cage, and am learning to like good foods and to play with toys. I`m not fond of all the humans in my family, in fact two of them I LOVE and the other two I just love to bite. Hah! But I have lots of friends to talk to during the day, I`m learning some new words to say (like "kiss! "), and I`m loved (even by the people I bite). I fell on my feet thanks to Mickaboo! From my name, you might think I was one of those Australian birds, but I`m a small South American dusky-headed conure named Sidney. My photo speaks for itself, but I can also speak and will tell you that I`m a "pretty bird." (I can say a few other words, too.) I`ve been in the same loving home for the eight years of my life but now my owners don`t have enough time for me. You see, there is one of those little humans toddling around, and another on the way, so now I have to spend too much time in my cage. I`m very tame and loveable and even will lie on my back in your hand. I want to be part of the family and be included in all your activities. So far, I eat seed and love fruit and cheese. (Maybe you can work on teaching me about pellets and veggies.) 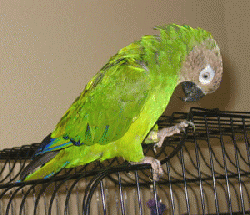 Like most conures, I can be rather noisy, especially when I need attention or something to eat. If you don`t mind some wild sounds and do want a big personality in a small bird, please come make my acquaintance.